Up until 2008, there were two well-known commercial Monte Carlo simulation add-in for Excel for performing risk analysis: @RISK from Palisade Corporation; and Crystal Ball from Decisioneering, Inc. These two products had been around for some fifteen years, with roughly equal features. In 2007, Decisioneering, Inc. was acquired by Hyperion Solutions Corporation, and in the same year Hyperion was acquired by Oracle Corporation. Crystal Ball sales amount to probably one ten-thousandth of Oracle's revenue, the sales, training and support processes had to be assimilated into a system designed for large database system sales and users quickly migrated to the only choice left - @RISK. Then in 2008, after five years of research and development, Vose Software introduced ModelRisk to the market, offering an enormous range of tools and features that had never been seen before. 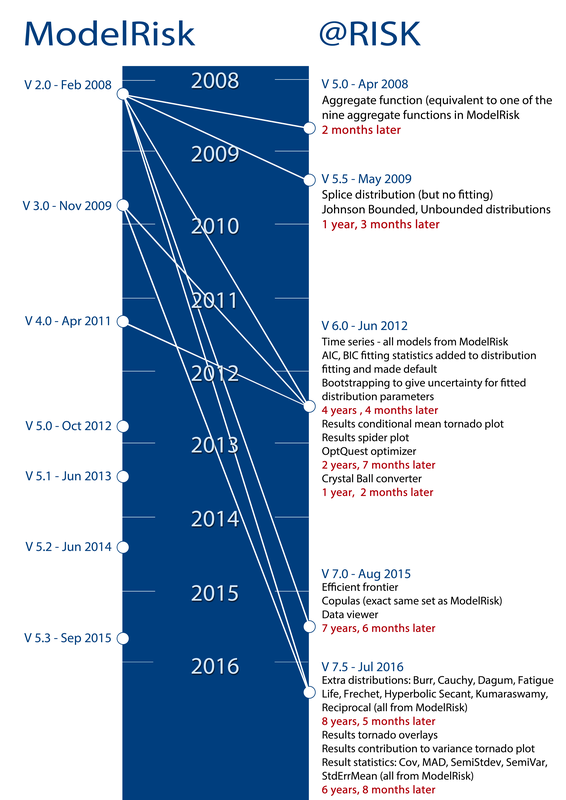 Crystal Ball remained fairly static in the features it offers, but Palisade Corporation has over the years tried to incorporate into @RISK some of the simpler capabilities of ModelRisk, as shown in the figure below. Many of the ModelRisk features that are only now being introduced into @RISK version 7.5 were already in ModelRisk in 2008 (eight years ago! ), and @RISK still has only a small fraction of the capabilities of ModelRisk. Comparing software products by their lists of features is a useful start, but it can be deceptive if a developer only adds a feature to be able to say ‘we have that too'. To pick two examples among many: (i) spliced distributions were added to @RISK in 2009, a very useful technique in financial modeling but, unlike ModelRisk, @RISK does not provide the ability to fit a spliced distribution to data which is in practice the only time spliced distributions are used; and (ii) assessing fitted parameter uncertainty using Bootstrapping was added to @RISK in 2012, but without the ability to simulate that uncertainty within a model which is when the technique is of real value. Ease-of-use is also critical – if you have tried using copulas (correlation structures) or time series models in @RISK (the exact same set of copulas and time series that ModelRisk has), you'll know what we mean. ModelRisk was designed from the beginning to have 90%+ of the core features it has now, so all the features work seamlessly and consistently together under the same design concept, with no legacy issues that come with adding new features into an older, sometimes conflicting framework. Certainly! ModelRisk has about twice the tools of @RISK even now, and ModelRisk is far easier to use. ModelRisk is also capable of connecting with our other project risk and risk register tools, as well as external databases. You'd be forgiven for thinking that ModelRisk costs a lot more than @RISK … but, in fact, the reverse is true, so if you are in the market for a new risk modeling tool, we think ModelRisk is the logical choice. Many risk modelers already have a copy of @RISK or Crystal Ball. For them, it is difficult to justify buying ModelRisk from scratch when they only have to pay the maintenance fee for their current product which ‘does the job well enough'. But don't despair – fill out the form below to convert@vosesoftware.com and we will send you an offer that we are sure you will find extremely enticing. How easy is it to learn how to use ModelRisk? 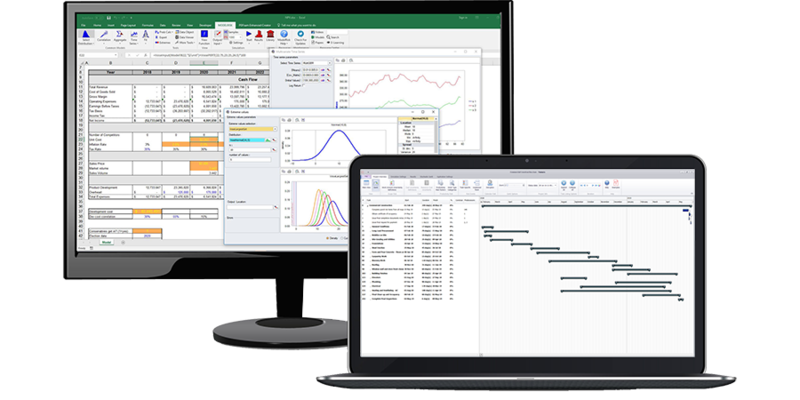 If you are an @RISK user, you will find ModelRisk very easy to learn because ModelRisk uses built-in, Excel-compatible functions just like @RISK and most other Excel add-ins. For Crystal Ball users, it will take an hour or two more as Crystal Ball uses an unusual overlay method, but it is worth the effort as the resultant models are more transparent and much easier to build and audit. We also offer free online training videos, example models and a very comprehensive help file which can all be accessed directly from within ModelRisk or online. What to do with @RISK or Crystal Ball models you already have? ModelRisk has a built-in conversion tool that will make a duplicate of most models. We also provide first-class technical support if you have any problems. Our roots are founded in risk analysis consulting which is still a critical part of our business. Helping clients with their risk-based decisions allows us to see how our software is used, how it can be improved, and provides the inspiration for developing new tools and features that will be useful in real problem solving. All our consultants are employees, not contractors, because having this knowledge in-house is what keeps Vose Software the leading innovator in risk analysis software. Developing stand-alone software tools for a specific issue in a cost-efficient manner by leveraging the core software routines we have already developed. How to switch If you're interested in switching to ModelRisk, please email us the filled in form below to convert@vosesoftware.com or complete the online form. We will send you back a quote within two working days.